Like the music it honors, The Bakersfield Sound has the power to move people in surprising ways. 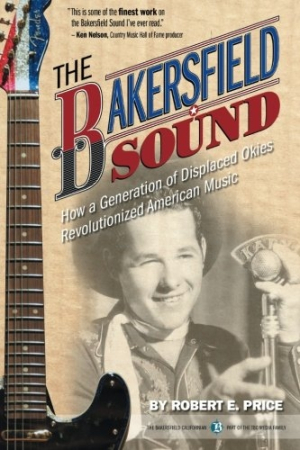 The Bakersfield Sound: How a Generation of Displaced Okies Revolutionized American Music by Robert E. Price is an in-depth portrait of a musical era and its legacy. The book is the culmination of Price’s research into the history and musical impact of the Bakersfield sound—the country music style that originated in Bakersfield, California, in the 1950s. The musicians who popularized this sound were largely the children of Oklahoma farmers who’d fled to California from the Dust Bowl during the Great Depression. Price details how the familial and geographic roots of these musicians influenced their sound: they’d known tough times and desperation, and they were far from home; the rough, raw, beautiful sounds matched their lives. The music also developed in opposition to the highly produced country music of Nashville. This is an inside look that includes anecdotes about legends like Merle Haggard, Buck Owens, and Johnny Cash. In addition to musicians, the book honors the venues, instruments, and promoters who empowered them. But more than merely recounting facts, the book captures the vitality of the era, and shows how it shaped music in later decades. The book is well organized and flows smoothly, balancing a quick pace with historical depth. The appendix profiles people and places, providing detailed snapshots of individuals, while the bulk of the book weaves people and places into a larger context; this allows the book to focus primarily on the era as a whole without sacrificing an in-depth look at individual people in the appendix. This book will appeal to those interested in music history, as well as to those who enjoy behind-the-scenes stories. Those who love the Bakersfield sound already, and those who are just warming up to it, will develop a deepening appreciation for the artistry and importance of the music. The Bakersfield Sound, like music itself, has the power to move people in surprising ways.